The maximum level that players can reach on their main class has been increased from level 80 to level 85. The maximum level that players can reach on their subclass has not changed, and is still level 80. 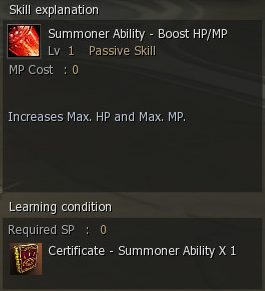 New main-class skills have been added. These new skills are determined by your subclass type(s). The types of skills that can be acquired by your main class differ depending on your specific subclass and subclass level. Even if you delete your subclass, the corresponding acquired skill(s) will not be deleted. Your main class can acquire a maximum of 4 specialized skills for each subclass you have. If you have all three subclasses, you can acquire a total of 12 specialized skills. While in your subclass state, go to your corresponding subclass master NPC and get your subclass ability certification. Take the certification to the Avant-Garde NPC in the Ivory Tower to acquire the corresponding skill. You can acquire the skill only while in your main class state. There is no main class level requirement to acquire these skills. None of the subclass certification items you receive can be dropped, destroyed, exchanged, or stored in a warehouse. The number of subclass skill certifications is restricted, so you must make your decision carefully. For example, if your first subclass receives a skill certification at level 65, even if you subsequently delete that subclass and raise a new first subclass to level 65, you cannot receive another skill certification for your first subclass at that level. You must complete the "More Than Meets the Eye" transformation quest in order to receive the subclass certification and to properly acquire the skill as your main class. Emergent Abilities - Physical Atk., Physical Def., Magic Atk., Magic Def. The Avant-Garde NPC in the Ivory Tower can remove the special main-class skills that you got via your subclass(es). The cost to do this is 10,000,000 Adena. Note: This removes all previously learned certified skills and removes all certified skill-related unused items from your inventory. If you have paid to have your subclass certification skills removed, you must return to your subclass master(s) to receive your skill certification items again. When you reach level 80 on your subclass, you can acquire a class-type-specific transformation skill that can be used while you are set to your main class. In order to acquire the class-type-specific transformation skill, you must complete the "More Than Meets the Eye" quest. Once you reach level 80 on your subclass and receive the subclass skill certification from the corresponding subclass master, you can obtain the "Transformation Sealbook". You can acquire your class-type-specific transformation skill by going to the Avant-Garde NPC in the Ivory Tower. Speak to him while you are set to your main class. Change to your Subclass and talk to the NPC. You can obtain for each key level a certificate. For Lv. 65 and Lv. 70 you can receive a certifivate (Emergent Ability) for a Common Skill (Physical Atk., Physical Def., Magic Atk., Magic Def.). For Lv. 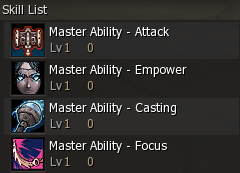 75 you can choose a certificate (Master Ability) for a Common 2nd Stage Skill or a certificate (Subclass Type Ability) for a various Special Skills that are determined by your subclass. For Lv. 80 you can receive one possible Transformation skill (Ultimate Skill) that is determined by your subclass. Then change back to your Mainclass and meet up with the Avant-Garde NPC in the Ivory Tower to aquire your designated skills. 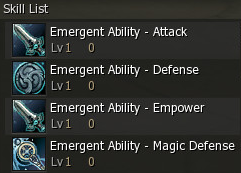 Your main class can acquire a maximum of 4 specialized skills (Lv. 65, 70, 75 an 80) for each subclass you have. If you have all three subclasses, you can acquire a total of 12 specialized skills. Your Mainclass is Elven Elder/Eva's Saint Lv. 79 and you have a Subclass Elemental Summoner/Elemental Master Lv. 76. In this case you are able to choose 3 Skills. You go to the NPC where you can change to your Subclass. Then talk to him again and obtain the 2x Common Skill Certificates for Lv. 65 and Lv. 70. Then you can choose between a Common 2nd Stage Skill Certificate or a Special Skill Certificate. Change back to your Mainclass. Now you go to the Ivory Tower and talk to the Avant-Garde NPC. You can choose 2 times between Physical Atk., Physical Def., Magic Atk. and Magic Defense. Depending on what you have obtained for your Lv. 75 you can choose between Common Skill 2nd Stage increased attack, magic attack, magic casting speed, physical critical chance, defense power and magic defense or Subclass based Special Skill Increased HP/MP, Resist Attribute, and Spirit (In this example case Summoner). This entry was posted on Sunday, November 14, 2010 by Hatschiline.